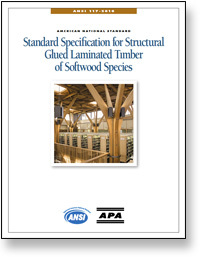 Download ANSI 117-2015: Standard Specification for Structural Glued Laminated Timber of Softwood Species. This standard contains information for the design of structural glued laminated timber (glulam) members. View the Glulam Committee Membership Roster. To apply for membership, download the Glulam Committee Membership Application Form. There is no active ballot at this time. Read the operating procedures for development of APA consensus standards.